Boss Jimmy Floyd Hasselbaink has hailed club captain Dave Buchanan for the player’s reaction to being left out of a Cobblers match day squad for the first time. 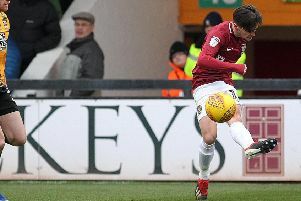 His one-match suspension for a red card last season aside, Buchanan had featured in the squad for every Cobblers game since joining the club in the summer of 2015. That was until last Saturday, when the 31-year-old was missing from the 18 named for the 2-1 win over Milton Keynes Dons. Buchanan had been left out of the starting line-up for the New Year’s Day clash with Wigan and the trip to Bradford City, but was still on the bench for those games. But with new signing Joe Bunney starting at left-back against Milton Keynes, there wasn’t even room for Buchanan on the bench. Hasselbaink admits the player is not happy about falling out of the first team picture in recent weeks, but he has hailed the former Preston man’s professionalism and attitude. “David Buchanan has been absolutely magnificent,” said the Cobblers boss. “He is not liking it, and I understand that, and that is good. “But in training on Monday he was one of the best, attitude wise, and he has been a proper professional. “I can’t ask for any more than that. “It is football, it is one of those things, and I have to make a decision. “At the moment David is out of the team, but in a few weeks you never know? With Buchanan dropped and Marc Richards having left the club, the on-field captaincy has been handed to central defender Ash Taylor, and Hasselbaink is delighted with the job the former Aberdeen man is doing. “He looks good, so he has a chance. “Ash has a lot of experience, he has been playing professional football for a while, and don’t get me wrong, we still have David Buchanan here, who is still the club captain and let’s not forget that. Taylor is set to captain the team again for this weekend’s tough looking Sky Bet League One trip to second-placed Blackburn Rovers. Town head north on the back of three straight wins and in good spirits, but Hasselbaink doesn’t want his players getting carried away, and wants them to remember exactly what has led to them enjoying their mini winning streak. “We have a very good feeling at the moment, but it is not about being arrogant, it’s not about thinking how good we are, it is about capitalising on this moment,” he said. “We need to keep on working, to keep on improving, and try to keep this good feeling with us for as long as possible. “We have to keep working really hard, that part of us has to stay, and the togetherness and wanting to move up.